Led by the great-grandniece of the famous Impressionist artist himself, this guided tour of the historic Degas House takes you through Edgar Degas’ former New Orleans home and art studio. Experience first-hand the setting that inspired many of his masterpieces, and tour the surrounding Creole neighborhood to see locations referenced in Degas' New Orleans letters. You also have the choice to enjoy a lovely breakfast with Bloody Marys and mimosas in the courtyard before your tour, or take a walking tour of the nearby New Orleans Museum of Modern Art. At your selected tour time, take a walk along New Orleans’ tree-lined Esplanade Avenue to the Degas House, the only home of Degas anywhere in the world that’s open to the public. This historic house is listed on the National Register of Historic Places and is included in the French National Order of Arts and Letters. Here, you’ll meet the great-grandnieces of the legendary French Impressionist artist himself. One of these professional art historians will be your guide for this walking tour, providing you with personal insight and intimate details about the artist’s life and work. Start by watching the award-winning documentary Degas in New Orleans, a Creole Sojourn. Travel back in time to the 1800s to when Degas was one of the leading artists of the French Impressionist movement. As you’ll learn, his full talent didn’t truly emerge until he spent a year living at the house with his family, prominent New Orleans cotton brokers, from 1872 to 1873. 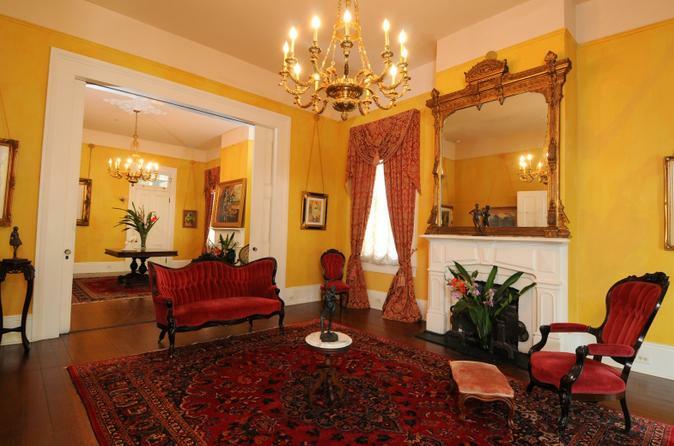 According to art historians and Degas scholars, all of his 18 paintings made in New Orleans were created in this house. You’ll tour both the two main houses – which double now as a museum and bed and breakfast – as well as the courtyard and the artist’s studio. Beautifully restored period furnishings are on display inside the house, re-creating the ambience of Degas' times. As you wander, you’ll see first-hand the settings outside of Paris that inspired many of Degas’ most famous paintings, and you’ll admire reproductions of his paintings adorned the walls. Be sure to check out the gift shop for one-of-a-kind Degas-inspired souvenirs! New Orleans Museum of Modern ArtSelect this option to include a walking tour of the New Orleans Museum of Modern Art, located just a short walk away from the Degas House. With your guide, continue reveling in Degas' masterful artistry on a leisurely stroll through this world-renowned museum, featuring more of the artist's beautiful Impressionist paintings. Courtyard Breakfast Rise early for an authentic Creole breakfast served at 9am in the Degas House's courtyard before your tour. This lovely setting provides the perfect ambiance to start your day. If you select this option, you’ll be treated to a cooked-to-order, homemade breakfast, with offerings such as French waffles with fresh fruit, over-sized Creole omelets with a choice of fillings or French toast topped with caramelized bananas. Enjoy complimentary Bloody Marys or mimosas with your meal!